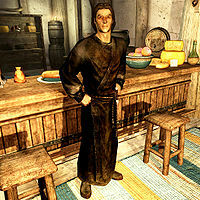 Sam Guevenne is a Breton conjurer that you will meet in a tavern, where he will challenge you to a drinking contest. The exact place where you find him is randomly chosen due to Skyrim's radiant story mechanic, but it may be the first tavern you enter after hitting level 14. Once the game has chosen his location, he will usually remain there until met. Likely inns or taverns include the ones in cities, depending on how many side quests you have done and how closely you are following the main questline. After you have accepted and won the challenge, he will say that you are good company to drink with and will invite you on a trip. This triggers the quest A Night To Remember, which will hold several surprises. After completing this quest, it is revealed that he is actually the Daedric Prince Sanguine, who was just looking for some fun. This page was last modified on 30 January 2017, at 15:03.